Likeable young guard Sam Gittins, just stitched up for a potential promotion, is harassed by an assortment of ungrateful, obnoxious, plain rude passengers on a late-night train, including THE DESCENT’s Shauna McDonald) right before it hits a deer and conks out, leaving the stranded ensemble to deal with a werewolf clan. 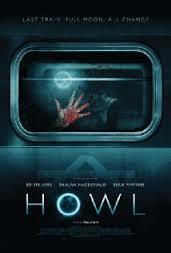 In an age of interchangeable post-UNDERWORLD / TWILIGHT computer generated werewolves, HOWL offers an atmospheric, back-to-basics one-location siege scenario. FX genius-turned-director Hyett’s stripped-down and suspenseful old-school horror picture gets everything right in a taut and unpretentious fashion. The two legged lycanthropes are effectively crafted via practical FX with CG augmentations, and Hyett knows just how much hairy paw action to show: one of the most powerful sequences – the unceremonious demise of a fat dude in a train toilet – is also the most inventively discreet. Evocative images of the old-school werewolves glimpsed in the full moon mist add to the overall effect, as does the pleasingly sinister backstory for their existence. What’s more, HOWL also remembers a key element too often overlooked in contemporary horror: an endearing hero who’s worth rooting for.